CEG has announced a pioneering new programme to provide vocational training and apprenticeship opportunities for local people in Leeds as part of its prestigious Kirkstall Forge development. Working closely with Leeds City Council the scheme could provide hundreds of training and job opportunities as 1,050 new homes and 400,000 sq ft of office, leisure, retail and community space is delivered on the 23 hectare Forge site. The initiative will deliver vocational training and personalised work placements for 14 to 16 year olds in the city as well as apprenticeships, pre-employment, training and employment advice for those unable to find work and keen to retrain. 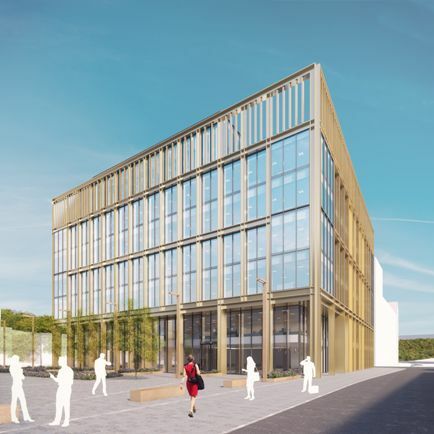 The first phase of the Kirkstall Forge development is the delivery of a 15,534 sq m, seven-storey office building which is set to start on site early in the New Year. Coun Mohammed Rafique, Leeds City Council’s executive member for employment, enterprise and opportunity, said: “As a council we are committed to ensuring that we work closely with developers and businesses to ensure that there is a clear focus on the provision of local employment opportunities when planning permission for new development is granted. The council will promote the scheme by working closely with schools and colleges and ensuring information is available in community hubs and other community organisations. Office space and resources will also be available on the Kirkstall Forge site to assist with job search and employment preparation activity. This is one of the north of England’s largest regeneration schemes and most ambitious projects. The new railway station will open later this year, providing a direct connection to Leeds City Centre in minutes. Some £300 million is programmed for investment in the site over the next five years and by 2020 almost 10,000 people will live and work at Kirkstall Forge in a thriving new woodland and waterside community.